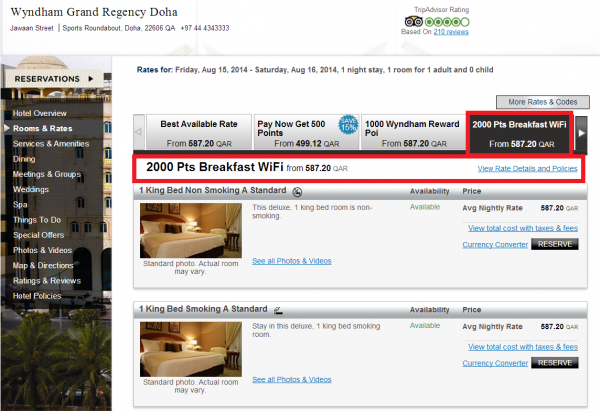 Select Wyndham hotels are offering a rate plan that comes with 2,000 bonus Wyndham Rewards points, breakfast for 2 and free internet for stays until September 2, 2014. Note that you must book specific rate plan to be eligible for the bonus points that may not always be a good deal. You can access this offer on Wyndham’s web page here. The rate at the French Quarter property is about the same as the best flexible one. There is a teacher appreciation rate that is a lot lower. The bonus points + breakfast rate is the same as the best flexible one. There is a lower prepaid rate that comes with 500 bonus points. Choosing the bonus points rate can make sense IF there are no other discount rates available (or someone else is picking up your stay tap). To qualify for the “Three More Reasons to Stay – 2,000 Bonus Points, Free Breakfast, and Free Internet” promotion (the “Promotion”), a Wyndham Rewards member must: (i) search www.wyndham.com or www.wyndhamrewards.com for rooms available on the desired date(s) at the Promotion rate at a participating Wyndham Hotels and Resorts® location, (ii) book the Promotion rate at a participating hotel and (iii) complete their stay as booked. Must be a Wyndham Rewards Member in good standing to participate. Free breakfast is provided for two guests daily and free Internet provided for the entire stay. Breakfast for additional guests available at an additional cost. Restrictions apply; advance booking required. Availability limited to participating hotels. Rate may not be available at certain hotels on all dates. Members who have elected in their member profile to earn airline miles or rail points rather than Wyndham Rewards points and who book and stay using the Promotion rate will receive their base earning in airline miles or rail points with the bonus denominated in 2,000 Wyndham Rewards points. One stay includes all consecutive nights at the same hotel regardless of check-ins or check-outs. A member is eligible to earn bonus points for up to three rooms per stay. Members should allow six to eight weeks after completion of the stay for any points and/or miles to be credited to their account. The Promotion and its terms and conditions are subject to cancellation or change at any time. The Promotion is subject to additional terms and conditions under Wyndham’s Guaranteed Best Rate program, details of which are available here. Rates do not include resort/service fees, taxes, incidentals or gratuities or additional per room, per night charges that may be imposed. Rate, taxes, applicable dates, advance deposit, credit guarantee and reservation cancellation policies may vary by hotel; please inquire at time of reservation. Cannot be combined with any other offer, discount coupon, sale promotion, prior purchase or purchase of a gift certificate. Visitwww.wyndhamrewards.com for full terms and conditions of the Wyndham Rewards Program or to become a member.